Before A League Of Their Own, there were "Bloomer Girls" baseball teams that barnstormed the United States from 1890s to 1934, playing local town, semi-pro, and minor league men's teams. 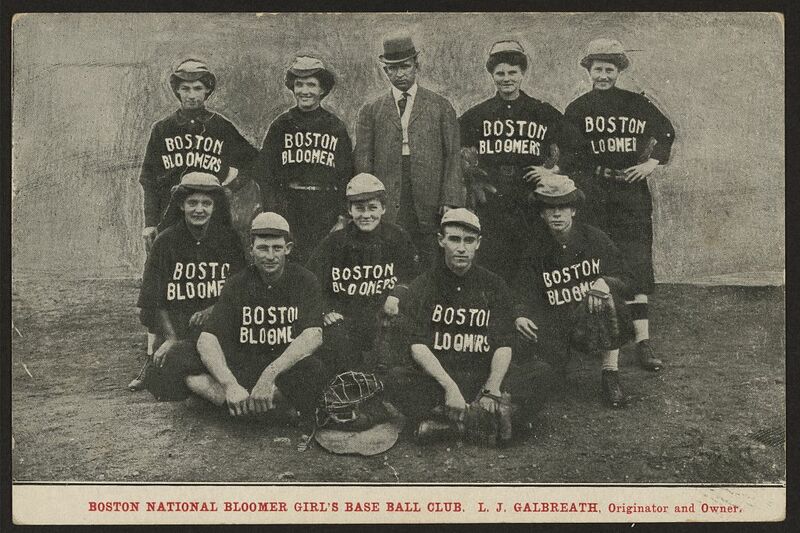 Boston National Bloomer Girl's Base Ball Club, L.J. Galbreath, Originator and Owner, published 1890 to 1910, Library of Congress Prints and Photographs Division. Bloomer teams, so named after the loose-fitting trousers they wore in the fashion of suffragist Amelia Jenks Bloomer, came from midwestern, southern, and eastern states and were made up of young, single women who earned a living playing baseball in a time when women’s professional options were very limited. Bloomer Girls traveled across the country, across states, and town-to-town by rail, bringing with them their own fences, tents, and grandstands. And their schedules were grueling: In 1903, the Boston Bloomer Girls played, and won, 28 games in 26 days. Over the July Fourth weekend of that year alone they played six games in five different towns in Oklahoma. The Bloomer Girls made frequent stops in Colorado, playing in Denver, Cañon City, La Junta, Lamar, Las Animas, Rocky Ford, Salida, and Trinidad. The sports pages of local newspapers, some recently digitized by the Colorado Digital Newspaper Project, describe lively games between the Bloomer Girls and hometown baseballers. In July 1898, the Boston Bloomers stopped in La Junta and played for a crowd of nearly 700 people. Two of the bloomers were unable to play and so their positions were filled by Rocky Ford players Red “Auburna” Lewis and George “Georgie” Daring, playing first base and catcher. Although the Bloomer teams were women’s teams, every team included at least one male player, often two or three. They were called “toppers” because of the wigs they wore, along with bloomers, to pass as women on the team (future Hall of Famer Rogers Hornsby was a “topper” for a time when he was a teenager). The La Junta Tribune reported that the disguise of the bloomer shortstop, one “Emma Kane,” was not very effective. “‘It’ did not give much evidence of femininity outside of the bloomers. Rumor says that he is a Chicago dude, with his hair parted in the middle.” The pitcher for a La Junta team, a gent named George Brennan, pitched such a great game (the Bloomers lost 6 to 7) that he was signed by the Boston Bloomers to play the balance of their 1898 season (“La Junta vs. Bloomer Girls,” La Junta Tribune, July 27, 1898 on Chronicling America). 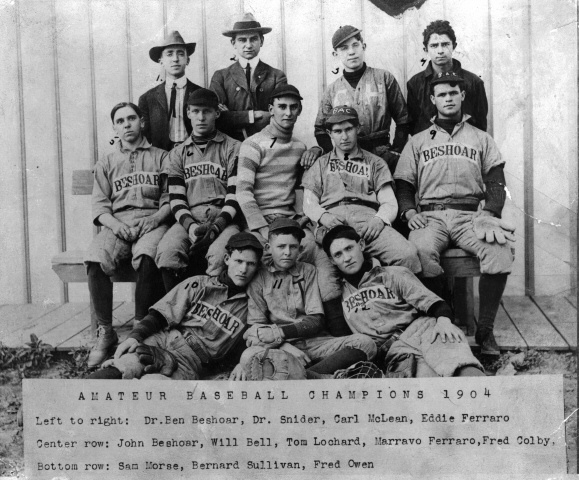 Amateur Baseball Champions 1904, Trinidad, Colorado. Trinidad Collection, History Colorado (83.496.1). The Bloomer girls have came and they have also went. The ladies from the intellectual center of the universe demonstrated that they are artists at the national game, and know how to play ball. The old stagers who attended and expected to be amused by the antics of a female baseball player were rather startled when they saw a “bloomer” line the sphere over the home plate with all the speed of a cannon ball. In the lineup for the Bloomers was Maud Wilson, playing shortstop, who during the course of the game assisted in two double plays and one triple. She “caught a hot liner...and doubled a man out at first in a manner that would have been creditable to almost any old professional.” Maud also made the hit of the game, knocking the ball over the canvas fence. Pitcher Lucy Hall, demonstrating “speed, inshoots, drops and outshoots,” struck out a number of La Junta’s hitters. In the sixth inning, a proper brawl broke out after one of the male chaperones of the Bloomers attempted to steal a bat belonging to the home team and got into a “wrangle” with one of the La Junta team members. During the “gab feast” the La Junta shortstop “handed the chaperone one in the neck.” Then each of the Bloomers grabbed a bat and started to the chaperone’s defense and, as the Tribune reported, “for a brief season it looked as though someone would have his nut cracked.” The appearance of the law quieted down the melee and the game continued, with the La Junta team soundly trouncing the Bloomers, 12 to 6 (“Boston Bloomer Game,” La Junta Tribune, August 19, 1903 on Chronicling America). 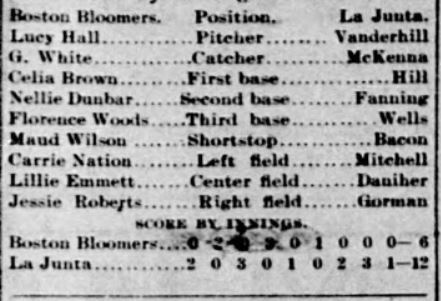 Lineup and score by inning for the Boston Bloomers vs. La Junta game from the La Junta Tribune, August 19, 1903. By the 1930s the Bloomer teams had hung up their gloves, and professional women’s baseball would disappear until the the formation of the All-American Girls Professional Baseball League. Information about the Bloomer Girls teams from Nike Is a Goddess: The History of Women in Sports (edited by Lissa Smith, Atlantic Monthly Press, 1999) and The Dickson Baseball Dictionary (by Paul Dickson, Third Edition, W.W. Norton & Company, 2011). Be sure to check out the temporary Play Ball! exhibit at History Colorado Center through the Rockies' season!